Do you know families that teach their babies sign language? I always thought it seemed like a great communication tool, especially when children aren’t yet talking. I’ve always felt impressed by babies who knew how to use signs. I’m a big communicator and I liked the idea of giving my baby more ways to communicate with me. I felt curious about teaching my baby how to sign, but I also felt daunted. I didn’t know any sign language myself, so I knew I’d be learning right alongside her. Last summer, around the time she reached seven to eight months old, I began really looking into how to introduce sign language. Almost a year later, we’ve both picked up many signs and use them on a daily basis to enhance our communication. Neither of us are fluent in ASL, but I hope we will continue to learn more and more. 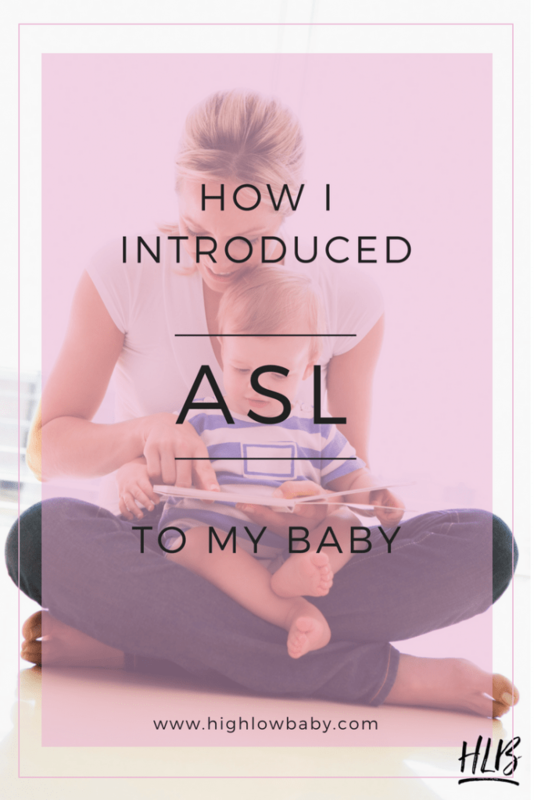 Through this post, I’ll outline the simple steps I took to introduce ASL to my baby. I started my research into baby signing by reading The Baby Signing Bible by Laura Berg. Berg is the founder of My Smart Hands, an organization that teaches parents how to sign with their babies. You can look for classes in your area or even take an online class through My Smart Hands. In The Baby Signing Bible, Berg explains how she taught her own children to sign, discusses some of the benefits of teaching sign language, and provides a dictionary of common signs for reference. The main approach Berg recommends is to introduce one sign to your baby each week. She encourages parents to start with three important words: “milk”, “eat”, and “more”. One word every week sounded very approachable, so I began my experiment. I started with the word “milk”. Before nursing, I would say, “Would you like some milk?” and make the sign for milk when I said the word. I did this consistently every time I nursed my baby. Many weeks later, I was delighted when she made the sign for milk! Even now that she’s speaking, she usually signs for “milk” when she wants it. One of the most surprising things for me about introducing ASL to my baby has been the way I might introduce a sign and not realize that my child has picked it up until she uses it herself weeks later! She definitely takes to some signs more than others. For instance right now she loves to sign “sun” and “baby”. The newest sign we’ve introduced is the sign for “ocean” since we live so close to the beach. I knew a friend had introduced sign language to her baby, so I asked about her method. She recommended checking out Baby Signing Time DVDS from the local library to see if I liked them. And she warned me that I might not ever get the songs out of my head, which is so true! I liked the DVDs and looked into the Baby Signing Time system. The DVDs can be expensive, but they’re also packed with information. Baby Signing Time sells their DVDS online as well as digital downloads here. After some digging, I found Baby Signing Time also has a YouTube channel where you can access many of their videos for free (you just have to watch ads). Some parents are more comfortable paying for an ad-free experience. Others prefer the ease of simply watching via YouTube. We do not own the DVDS, though I have checked them out from the local library from time to time. Baby Signing Time became a part of our daily routine together. 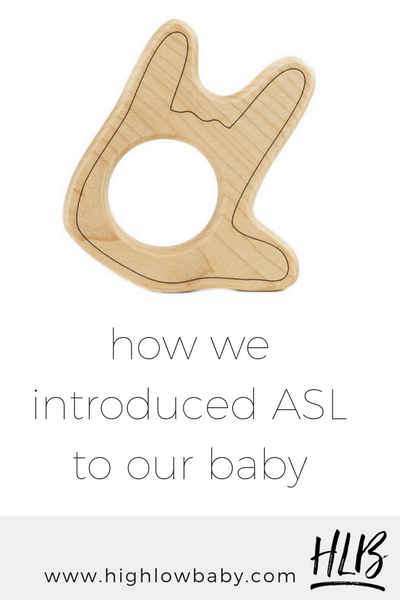 Since I had no prior exposure to ASL, if I knew that if I wanted to pick up some signs (and actually understand if/when my baby was communicating through signs!) I would need to watch Baby Signing Time too! We started watching the same handful of Baby Signing videos again and again. Once I noticed my child using the signs she’d encountered in the videos we’d watched, I would introduce a new batch of videos to rotate with the older material. The good news is that the people at Baby Signing Time have produced a ton of great content. I made it a point to sign when we encountered familiar objects when we read picture books together. For example, when I saw an illustration of a fish in a picture book, I’d make the sign for “fish” as I read the word aloud. My child will often sign or make sign approximations when we read. I tried to sign as much as possible as a part of our regular conversations. Though I had (and still have) a limited knowledge of ASL, but any time I did know the sign for something, I made it a point to sign. I signed about bananas at breakfast time and birds during our walk. I signed about water and taking a bath. I signed about reading books. I signed about getting into the car. When I saw an opportunity to include signing in our daily routine, I tried to seize that opportunity. There are still many, many signs that I don’t know. I’d like to learn the ASL alphabet and teach it to my daughter so that we can learn how to finger spell. That said, I love that we have introduced ASL. It’s a fun learning activity and at this point integrating signs is just a natural part of how we communicate. I’m interested to see where we take it from here! I feel a fun bond with other parents who know the songs from Baby Signing Time. Are you teaching your baby to sign? How did you introduce ASL? Do you think you’ll continue learning ASL even after your child is talking? I’d love to hear about your experiences with baby sign language! I was a stay at home da in the 90s and early 2000s. I wrote two e-books based on my experiences, “Sign Language for Hearing Babies” and “Your Child’s Most Important Teacher”. If you would like to read either of both, contact me at [email protected].